making: ROBYN'S FETISH CHALLENGE # 327 "FAIRIES"
Hello to everyone!! Hope you had a fabulous week. Really hot here so I had to stay in most of the time. Due to a medication that I take, I can't be in direct sunlight and when I get to hot now I immediately get real sick. I use to love being outside and doing things. But if you need it to help you. You have to deal with the side effects. Let's get to this great challenge. I had so much fun with it. This is a new sponsor we have here. 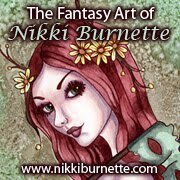 Her name is Nikki Burnette and she owns The Fantasy Art Of Nikki Burnette. Her store is amazing. I'm so lucky that she let me use the image "Cheyanna Autumn Fairy." Cheyanna is a fairy that is sitting in the woods with four foxes and some butterflies. I have to say that she has talent and she lives just an 1 1/2 hours from me. I would love to take lessons from her. So here is the card I call "Forest Fairy." Thank You for stopping by to see this week's challenge. Everyone here at The Robyn's Fetish Challenge Blog would love to see what you make with your fairies. Then enter them in our challenge. You can't win if you don't enter. Have a Wonderful Week.